One of the most common questions we’re asked when we tell people how we backpacked Europe for under $2,500 is how we found such affordable transportation. If you’re traveling to Europe on a budget, then this article is for you! We will outline the various options and Apps we use when we travel throughout Europe to help save you money! One of the most obvious choices is car rental. Although this isn’t one of the cheapest options, it may be necessary depending on your itinerary. During our backpacking trip, we rented a car in Zagreb, Croatia, to get to Plitvice Lakes. We spent about 35 EUR for the day, which ended up being loads cheaper than any tours offered there. To bring expenses down, consider using a ride-sharing site such as BlaBlaCar (more on that later) to fill any empty seats, or tag along with others on BlaBlaCar who have their own car for a small price. Also keep in mind parking fees if you are going to be spending time in big cities. We use Kayak to cross-search different sites and find the most affordable car rentals. Our all-time favorite way to get between bigger cities in Europe is Flixbus. Depending on the distance, tickets can cost you between 5-50 EUR. All their buses have wi-fi, and most have outlets to plug your phone in. We used Flixbus as our main source of transportation on our Europe trip and highly recommend the company for between country or between city travel. If you are traveling between two further apart cities we recommend getting on Skyscanner and checking flight prices. We typically spend no more than $60 for flighte within mainland Europe, so this is definitely an option to keep in mind. On our backpacking trip we chose to fly between Berlin and Amsterdam for $57 each, as Flix bus tickets were 45 EUR and it would take 8 hours to get there by bus, versus just an hour and 15 minutes by plane. Trains are expensive in Europe, but may be necessary as some towns are not accessable by car (e.g. Zermatt or Cinque Terre). We only resort to trains if there isn’t a bus option available, if we can’t find a ride on BlaBla car or if car rental is too expensive, or if it is the only option to get to our destination. Note that purchasing a train ticket ahead of time is much cheaper than purchasing at the time of departure, so plan your trip ahead of time! Eurail passes are another option for traveling Europe by train, but there is much debate to whether or not they actually save you money. The best way to see if they will actually save you money is to price out each individual train you will take beforehand, and then see if the Eurorail pass saves you money or not. If you are planning on taking many longer train rides, it may save you money, but if you are looking at a bunch of shorter train rides it may not be worth it. We recommend looking at The Man in Seat 61’s blog if planning a trip by train, as he has up-to-date information on trains all over the world. Our favorite ride sharing website is BlaBlaCar. Rides are super cheap, typically costing less than half the price of buses or trains. You simply enter your start and end destination and the date/time you are planning on going and see if there is anyone going you can tag along with. Then once they approve you, you pay a small gas fee and get to ride with them to your destination. This also works if you rent or own a car and have extra seats available. You can post that you are leaving this day and time from point A to point B and how many seats you have available, then people can pay you for a ride there. This option is probably the cheapest, but also the least reliable, as there may not be anyone leaving from your location to your destination on the day or at the time you are trying to go. But as long as you plan ahead this is an excellent option for budget transportation, and can be a great way to meet the locals, too! The website Rome2Rio is awesome when it comes to finding the cheapest ways to get to places. It compares the cost of flights, buses, boats, trains, and taxi’s to give you the cheapest option for your journey. I highly recommend downloading their mobile app and using them while planning your trip. Keep in mind to still check blablacar for ride sharing options that can cut your travel expenses even more. Want a guidebook on backpacking Europe? We recommend this one here! Have you ever been to Europe? 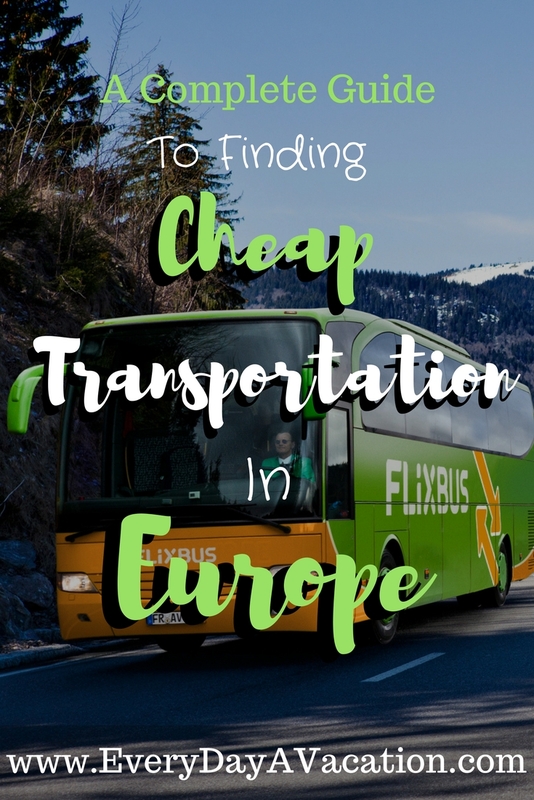 Comment your experiences below, and feel free to share if you have any tips or tricks for finding cheap transportation in Europe!